CHARLOTTE, N.C. - Senior Amir Hall (Bowie, Md. ), sophomore McDane McFarlane (Uniondale, N.Y.) and freshman Joshua Pryor (Baltimore, Md.) were voted to the Week #2 CIAA Football Honor Roll as selected by the conference football coaches and Sports Information Directors on Tuesday afternoon. 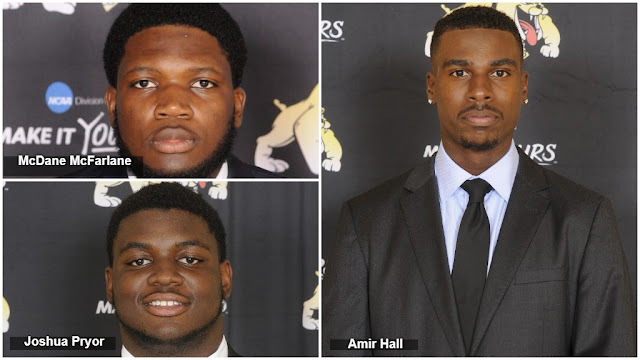 This marks the second consecutive week Hall was named Quarterback of the Week while McFarlane was selected as Offensive Lineman of Week and Pryor was tabbed twice, Rookie of the Week and Defensive Lineman of the Week. McFarlane was instrumental along the Bowie State offensive line, helping the Bulldogs to over 400 yards (494) of total offense for the second straight week. Hall had another stellar performance in guiding Bowie State to 38-31 road win at Alderson Broaddus, completing 27-of-41 passes for a game-high 365 yards (four touchdowns), the same total he had in Week #1. Pryor had an outstanding performance versus the Battlers of Alderson Broaddus, recording a game-high 13 tackles (8 solo and 5 assisted), half a sack, and 3.5 tackles for a loss. The Bowie State Bulldogs (1-1) will hit the road for the third straight week, this time making a first-ever trip to McKendree University (Lebanon, Ill.) for a 1 p.m. (Central Time) non-conference showdown against the Bearcats.